If you expressed each year as a percentage of your life to date then each one is worth less than the the one before. before. Back in 2000, each year represented about 3.3% of my life; this year that number will be 2.6% of my life. So, I guess, each year appears to pass quicker because it represents less of the time you have spent wandering the earth. e television show is on. Boston Legal, one of the best TV shows on today, starts a brand new fourth series on Thursday on Living TV. But you wouldn’t know because it’s not been promoted well. They have been showing ‘coming soon’ promotions for a few weeks but I’ve only just seen the date. I could easily have missed it. Pop along to the Living TV web site and it’s mentioned but I am not checking every day. Perhaps I should, ‘Extreme Skinny Celeb Mums’ must be post in itself . Where is the TV episode alert system? Somebody should do it. Get a simple email notifying you when the next series of your favourite shows start. Prison Break back on Sky One? Just a little note to let you know.I don’t want to know when every episode is aired. I can find that out once I know the series is starting but I can’t watch all the channels all the time and would like a little reminder. 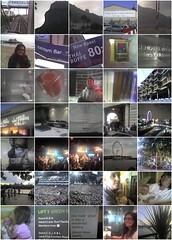 Another New Year and time for the regular yearly review as seen through the pictures that I take on my mobile phone. At least this year I am posting the pictures at the very beginning of the year! This year’s mosaic features 7 rows (for 2007) of 5 pictures. The original idea was that pictures captured on a mobile phone provide an interesting view of the year. This year the Flickr photostream for my mobile shots shows 74 photographs – but many are from earlier in the year. See the full collection at Flickr. Of course, they only represent a snapshot of the year; a fuller collection for the year can be seen under the 2007 Flickr tag.